Sometimes, I like to take a big break...mission accomplished! It's not that I'm not cooking, it's most likely that I am either too busy to type anything or (this summer for instance) we just get too busy for anything but can-a-box dinners. Two dinners we have had recently had me thinking I should write about them, and then a request for a recipe pushed me over the edge tonight...and I'm back! Last fall, we went in with a friend and bought a half a cow. If you have the opportunity, I highly recommend it. It has been a culinary challenge for me, cooking cuts of meat I would normally avoid at the grocery store. Also challenging, we each got 65 pounds of ground beef. When we put the deposit down on the cow-half, I had thought it would probably be about 50 pounds ground--no big deal, a pound a week, that's probably what we are eating from the grocery store anyway. Nope, big deal, it's been ten and a half months and we still have more than 30 pounds left. So today, I went shopping without a list or a menu for the week. 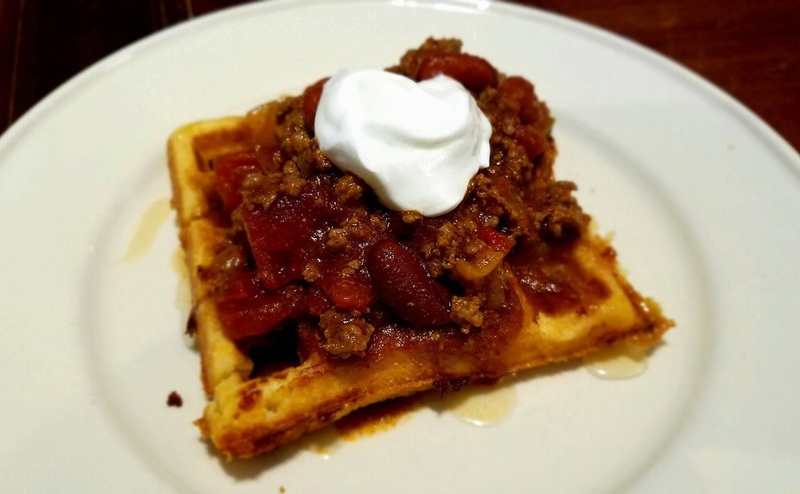 I passed some plump jalapenos in the produce aisle and decided on chili over Jalapeno Popper Cornbread Waffles. Back at home, I pulled not one, but three packages of beef from the freezer...go big or go...still have beef in your freezer after New Years. I won't bore you with the details of the rest of my day (I did get most of my "Killer Frost" Halloween costume made), we will skip right to the recipe. I'm not including a chili recipe here, I usually follow the directions on the "ready for chili" diced tomatoes can and doctor it up till it tastes good. This afternoon, I added 2 sweet onions, chili powder, corriander, cardamom, a spoonful of brown sugar, ketchup and hot sauce to the loosely followed can label recipe. Ok, one more last note...my hubby took the picture. My pictures never look like that, and we have essentially the same phone. When I asked how he does that, what settings does he use, his only response was "Pro." Hmph! Cook the waffles according to your machine's directions, but a good rule of thumb is that waffles are done when the steaming stops, so ignore the sensor / ready light and watch the steam. To serve, we like to drizzle some honey over the hot waffle, top with a scoop of chili some shredded cheese and a dollop of sour cream.